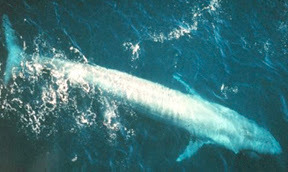 Whales like the blue, fin, or minke whales, feed primarily on krill or large masses of fish eggs. To do this, they swallow large quantities of sea water laden with prey and filter out the krill through long fibrous blades jutting down from the upper jaw. These fibers are called baleen - hence the term baleen whales used to describe these types of whales. More specifically, these they are also known as rorqual whales. The blue whale, the largest animal on the planet when full-grown, feeds in a particularly dramatic fashion. When it senses that it is in the midst of a large quantity of prey, it will open and expand its lower jaw and the pleated skin beneath the jaw will expand like it just swallowed a New Mexico hot air balloon. By doing so, the whale is able to take in an enormous 100 tons of water and filter out as much as 1100 pounds of krill - all in about 10 seconds. Many of you have probably seen photos or film of these large whales feeding, so it's not necessarily news. However, what is news is the fact that researchers have furthered their knowledge of just how the whale is able to do this. For the whales, it apparently is not all that easy to do and requires several neurological and physiological triggers and events to take place, involving nerves, bones and muscles. According to researchers, it's a big deal. As reported in BBC News/Nature, "A rorqual whale's feeding lunge was 'one of the largest biomechanical events on Earth', said Dr Nicholas Pyenson of the Smithsonian Institution. 'This shows us how they do it so quickly, co-ordinating the inflation of the throat pouch with the opening of the jaws... and closing their mouth to prevent prey escaping - all in under 10 seconds.'" Researchers from the Smithsonian and the University of British Columbia have come upon a structure in the tip of the lower jaw that had previously been considered as a gelatinous mass that probably served as a lubricating hinge at the juncture of the right and left lower jaws. However, by conducting dissections on fresh whale carcasses at an Iceland whaling station, the researchers were able to determine that the structure was packed with nerve endings that most likely sense the first initial opening of the lower jaw, thereby alerting the brain and triggering a series of muscular steps to widen the jaw and expand the pleated skin and muscles attached to the lower jaw - thereby producing the cavernous gulp for its lunch. With animals this large, sometimes certain physical movements require a series of steps, all commencing when neurological signals say its time. It makes me think of an old steam locomotive with a line of cars sitting on the tracks. A conductor may give the signal to start a cycle of events that culminates in a multi-ton machine lumbering on down the tracks. Without that conductor giving signals, the train just sits there, leaking steam. Dr Gareth Fraser from the University of Sheffield said that the discovery revealed a unique adaptation that these marine mammals had made to an "aquatic lifestyle". It showed, he said, "how much we still have to discover, even from the largest ocean residents."